Every month we randomly pick a day then offer a ‘good deed’ assignment that is meant to take place, around the world, on that same day to help create strong positive vibrations throughout the planet. Our year long campaign is called “Catch A Smile” and it encourages everyone to perform at least one random act of kindness each month. In many cases, those who receive a kind gesture will then pay it forward thus creating a waterfall effect of joy, kindness and generosity. CWC co-ordinator, Ayesha, and I proceeded to push the idea forward. We created hand-made cards, sorted out gifts for each of the female attendants as well as packed chocolate bars for male attendants we spotted in the hallway outside the washrooms. 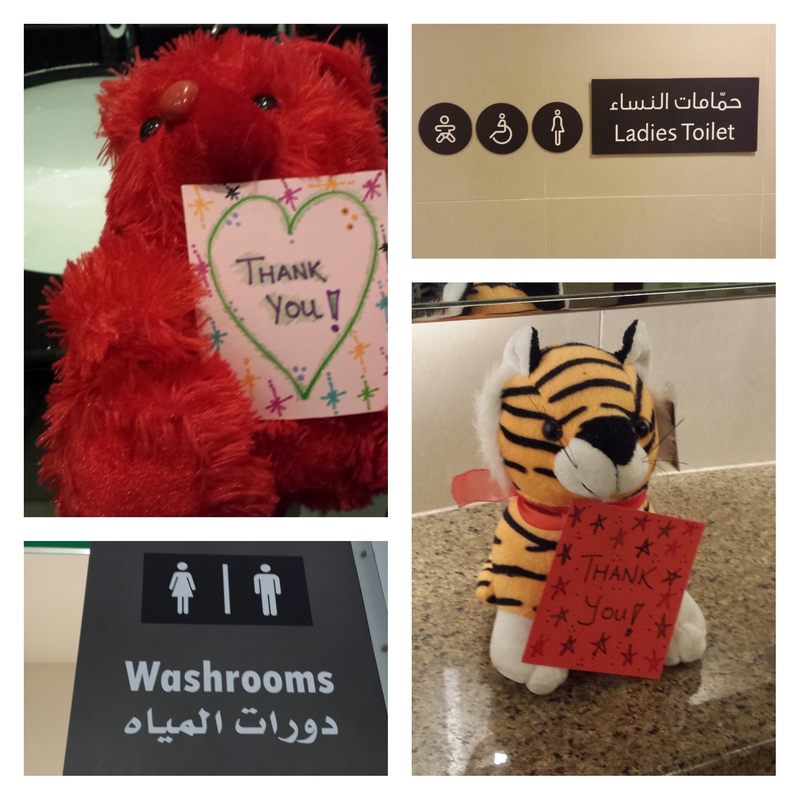 We chose two malls, Mall of the Emirates and Dubai Marina Mall, and went on a field trip to each washroom. I slowly approached the first woman and said “Excuse me. We know you have a very hard job. We just wanted to say thank you and we hope you have a good day” while handing her a super soft and cuddly stuffed animal with a thank you note. Most of the women were genuinely stunned for the first three seconds then presented us with a huge smile. One woman was very excited and kept saying ‘thank you, thank you…may God bless you.” We were able to spot male attendants and they were very happy to receive sweets. It was an extremely humbling experience for Ayesha and I. The smiles those women gave us were so genuine and beautiful….. and all we did was take a moment of our time to appreciate them. 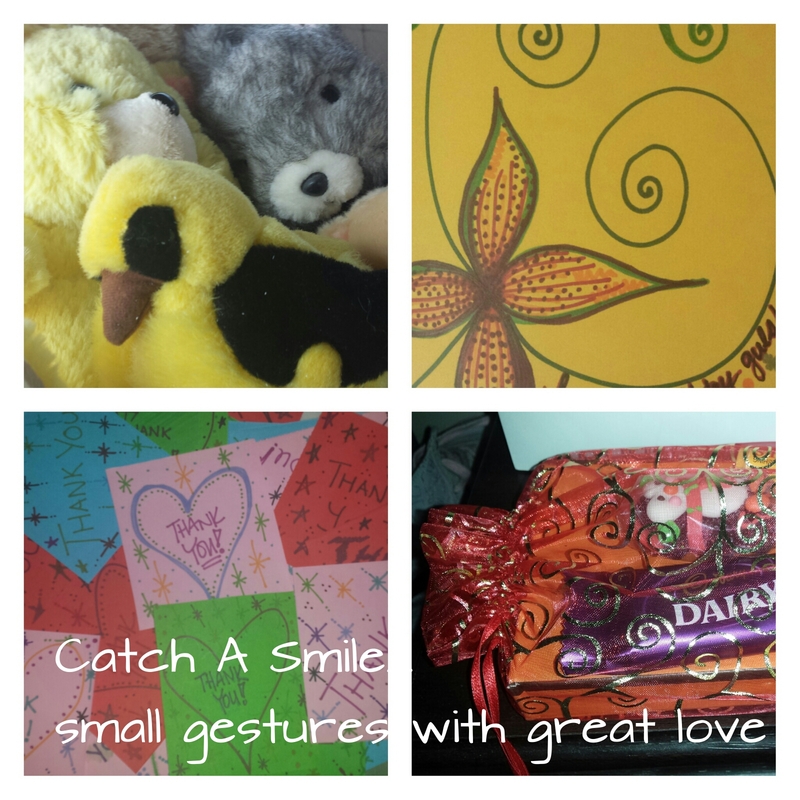 “Small gestures with great love” is the campaign’s motto. If you make a sincere offering or throw your smile, someone will catch it and hold it tight. I can only imagine what it must be like working in a bathroom, breathing that stale air all while cleaning up after people for 8 hours a day. I hope and pray that we all take a minute to acknowledge and converse with these women from now on. I certainly will. Step 3 :: Delivery time! Every womens bathroom in MOE and Marina Mall as well as the male attendants we spotted. This entry was posted in Uncategorized and tagged ayesha fernandes, catch a smile, Clowns Who Care, CSR, dubai, give back, Mina Liccione, UAE by clownswhocare. Bookmark the permalink.